Now that it is not freezing, it’s time to get outside and grill. There are two different ways of cooking on a gas grill. First, there is direct grilling; having the food directly over the flame and using a higher heat, which cooks faster. For example, direct grilling is good for steaks, chicken breast, fish fillets, and vegetables. With this type of cooking, you can use one, two or three burners depending on the quantity of food and the size of your grill. When grilling indirectly using wood chips or pellets in a smoker box, the food requires a lower temperature and a longer period of time to cook. When putting your food in a smoker grill, you should first decide the type of meat, poultry, or seafood you are going to be cooking. Next, you should choose the type of wood you want to use, whether that is wood chips or pellets. If you are deciding to use wood chips, you should soak the wood chips for about 30 minutes to an hour. The stronger the wood the less time you will have to soak it. Wood chips are for shorter cooking periods. Not to mention, wood chips come in many different flavors like apple, hickory, and mesquite. Different woods will have different flavors. Mesquite has a strong and full-bodied flavor, apple has a delicate flavor, and Hickory has a bolder taste. If you are choosing pellets, you should not soak them. Pellets are made by compressing wet sawdust and turning it into small rods. When they get wet they revert back into sawdust and mush. A lot of grill masters use pellets because it can easily be fed into a smoker box, in a controlled manner. Pellets burn quickly so they are more suitable for a shorter cooking time because they burn hot and clean. Pellets are suitable for smaller cuts of meat, fish, and poultry. Different outdoor grills will smoke the food in different ways. Weber grills started back in 1952 by George Stephen Sr. in Chicago, IL. George Stephen Sr. was working for the Weber Brothers Metal Works manufacturing marine buoys. He cut a buoy in half and put vents in and added legs to invent an outdoor grill. Most of the Weber gas grills do not come with a smoker box. You purchase the smoker box as an accessory. 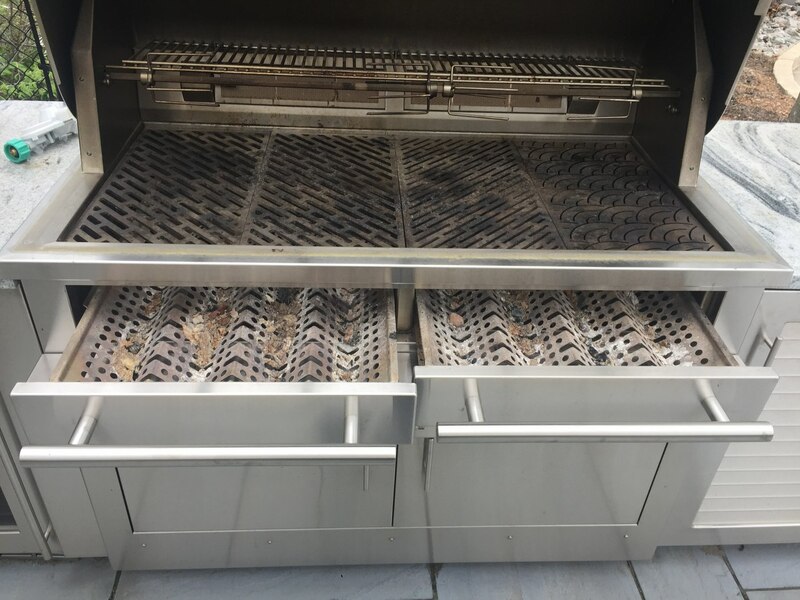 Model 7576 stainless steel smoker is hinged with large tabs which will allow you to add chips in while smoker box is in use. You sit the smoker on top of the cooking grates. Weber also recommends using a drip pan with soaked wood chips covered in foil, put it on top of the grill and punch holes in it. Close the grill top it is ready to grill. The Summit has a separate smoker box on the right side of the grill. It is rated at 6,800 BTUs, which is on the high end for smokers in BBQs. Dynamic Cooking Systems (DCS), started in California in 1988. They developed high-end commercial cooking products. DCS then realized that there was a market for high-quality stainless steel appliances for the residential market. In 2004, they were bought by Fisher & Paykel, a company from New Zealand. In 2008, American Test Kitchen and Cook’s Country TV shows developed a partnership with Fisher & Paykel to cook with their appliances on these television shows. The DCS smoker boxes are built into the 36 and 48-inch ranges. It has its own dedicated smoker box with a 3,500 BTU burner. It has its own sealed compartment so it can accommodate dry or wet chips and even hold liquid. For example, it can hold beer or onions. The smoker tray also has a lid with holes to assist in controlling the amount smoke into the grill. You can adjust the temperature on the dedicated burner from high to low. DCS grill master cooked a brisket for 6-7 hours just on the smoker burner box and then moved it over to the higher burner to brown the meat for 30 minutes. 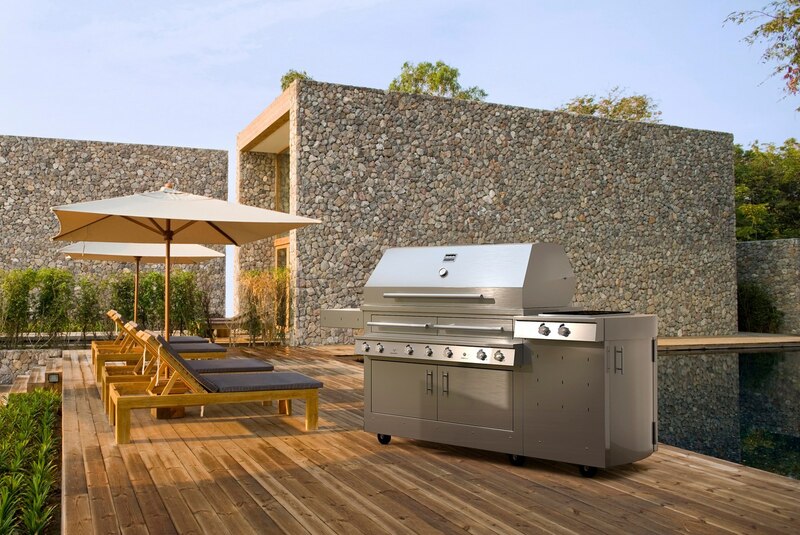 Lynx Grills, a privately owned company, started in 1996 in Downey, California. 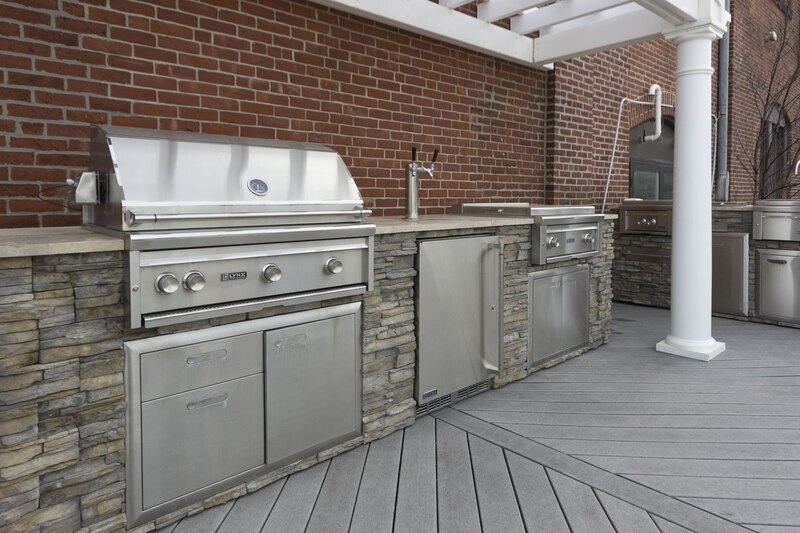 The manufactured high-end outdoor grills and custom outdoor kitchens by a group of people that worked in the stainless manufacturing of commercial appliances under the name BECCA. A very successful company, they developed a full line of grills including Smart grills with options of using Wi-Fi and voice activated from smartphones. Recently, the Middleby Corporation purchased the Lynx grills company. Middleby is a publicly-traded company on NASDAQ. They own 50 different companies which manufacture, sells, and distribute products, around the world. 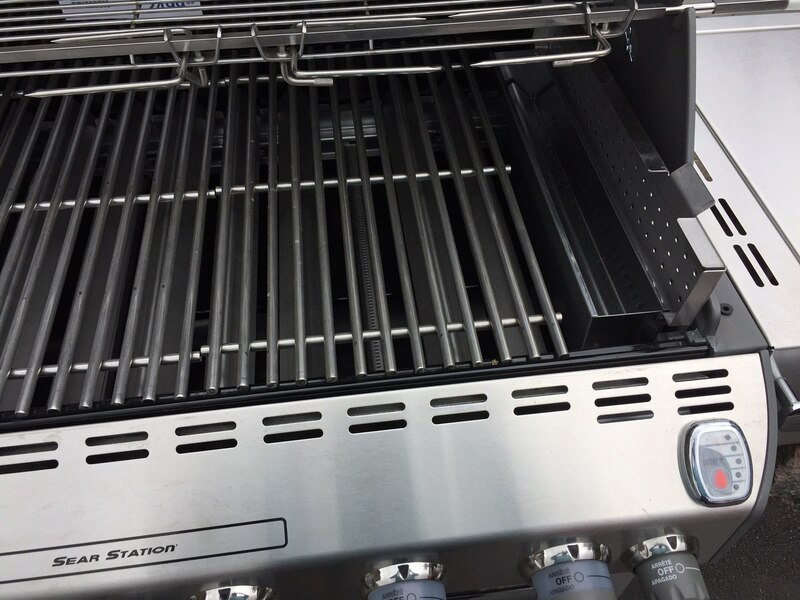 The Lynx Professional grills come with a smoker box which is a long skinny oval stainless steel box that sits anywhere on burner grates. You can also put the smoker box over the searing burner for faster cooking. It takes very little space on the grates. The box can be used with any smoker pellets or wood chips. Lynx recommends 3 oz. of wood chips or pellets which do not have to be pre-soaked. Just fill the smoker box. The smoker box comes with a handle to move the box around the grates. For the best results, set the burners at medium to medium low to achieve the proper temperature to smoke. Importantly, for the best results do not have the temperature to high. Also for the best results keep the lid cover closed. Kalamazoo Outdoor Gourmet LLC based in Chicago has established 100 years ago. The manufacturing of the grills is done in Kalamazoo Michigan. Kalamazoo developed a hybrid grill that cooks with charcoal, wood, and gas. It has the ability to cook over gas, charcoal, and wood all at the same time. 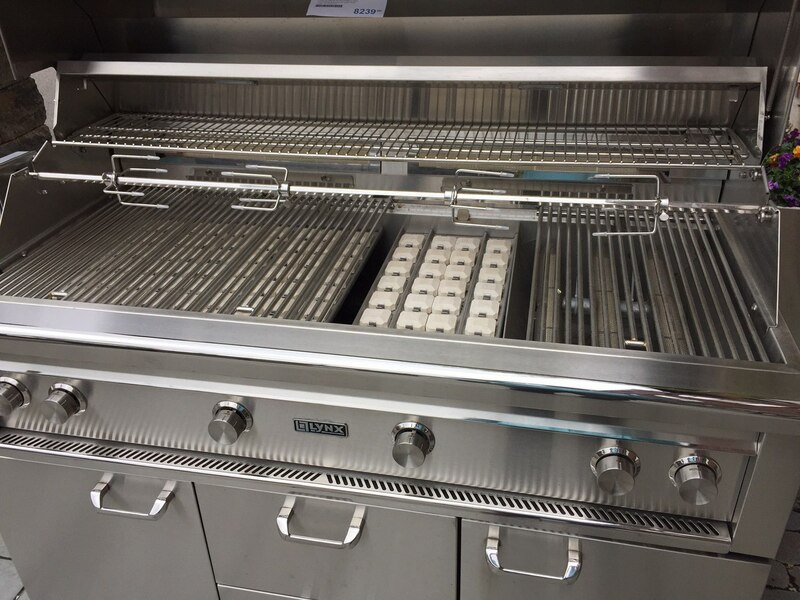 The hybrid grill drawer works by first turning on the gas and adding charcoal and then adding wood chunks, tree limbs, or split logs or use wood chips and charcoal only. This gives it unique flavors to the meat. A second way to smoke on a Kalamazoo grill is a side-mounted smoker box. 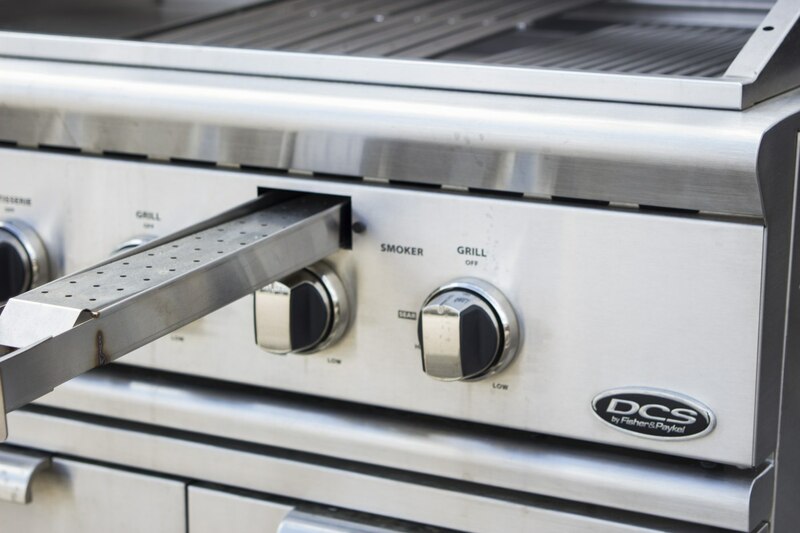 The baffle on the offset smoker box controls the flow of oxygen and venting of the smoke into the grill chamber. Build a charcoal fire in the smoker box and when the charcoal turns to ash; add wet wood chips on top of the fire and close the smoker box and baffles to burn out the fire. Once that is done a large amount of smoke will be coming out of the smoker box. Next, open the baffles leading to the grill chamber to begin venting the smoke towards the food. Using the rear exhaust vent baffles forces the smoke away from the grill chamber. There still could be a fire in the smoke box. You will need to snuff it out a few times through the cooking process. You can add water to the water tray in the smoker box to add moisture during the smoking process. A third way is to add wet wood chips directly onto the charcoal. Make sure the charcoal is cool and wood chips do not go into flames. The important part is that the coal turns to ash and signs of flame before adding wood chips. A fourth way is to make a tinfoil envelope with soaked and dry wood chips to sit on top of the grill. You can make a big envelope and it will last for a longer period of time or make smaller ones and change them out every half hour. You put holes in the tinfoil. Before putting food on the grill, place the tinfoil envelopes on the inside of the Hybrid grill drawer or on the grates. You can also put envelopes on top of the charcoal. You can smoke on any type of grill. You buy a Weber, DCS, Lynx or Kalamazoo. It depends on the way you want to smoke your food. The simplest way is to soak wood chips in a tinfoil envelope and punch holes with a fork or fill up a foil pan with soaked wood chips, sit it on top of the grates and close the grill cover. This can be done on any type of grill. When you go to the more expensive grills like DCS and Lynx Professional, they already come with smoker boxes. The DCS works well because it has its own dedicated burner that goes up to 3,500 BTUS. The smoker box sits under the burner grates. It makes it safer and easier to control the heat coming from the smoker box. Lynx now comes with a smoker box that sits on top of the grates and can be moved around the grill to different burners. The best way to smoke your food is on a Kalamazoo Gourmet Outdoor grill. It has a unique hybrid grill drawer. You can add wood chunks, tree limbs, split logs or use wood chips and charcoal only. That gives a unique flavor to the meat. You can use charcoal or gas to smoke the food. This grill gives you many different ways to use the smoker. 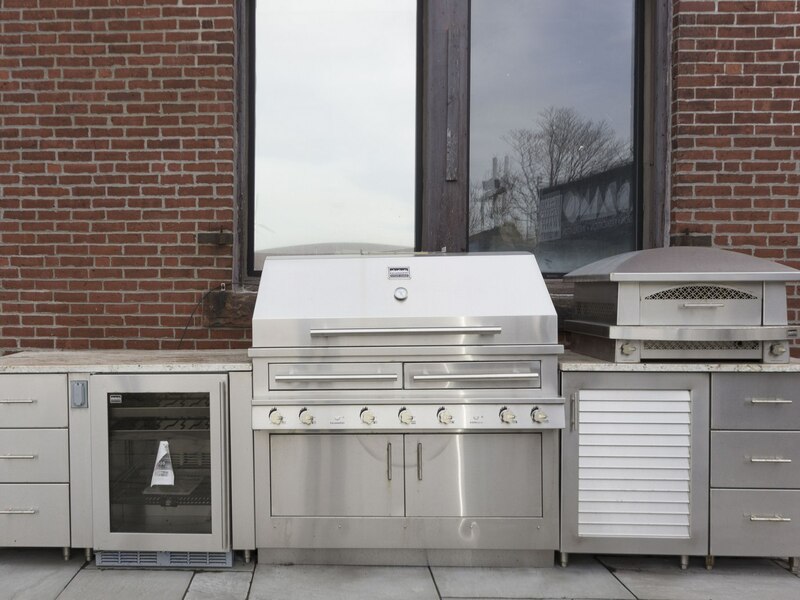 Get the Yale BBQ Grill Buying Guide with features, specs and inside tips to all the brands. Over 220,000 people have already found answers in a Yale Guide.